The Cypress Landing Women’s Golf Association (WGA) was formed in 1998 with just 18 women. Today, our membership exceeds 115 members. We are the largest WGA in eastern North Carolina. We have an active membership which includes residents and non residents. 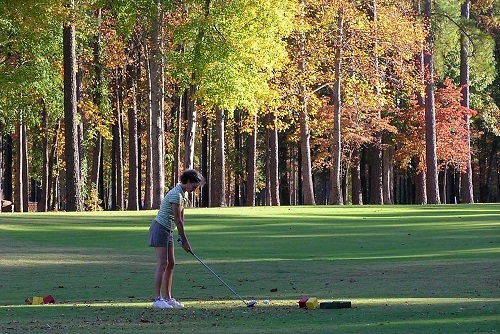 The reason we are the largest women’s golf association in eastern North Carolina is because of the mentoring with new golfers, the emphasis on friendly competition and having fun. The purpose statement of our association is to increase active participation, to encourage friendly competition, and to promote interest in the game of golf among the ladies of Cypress Landing Golf Club. A WGA Handbook is provided to each member with important facts and explanations for the new comer. The WGA Bylaws can be accessed here. The WGA has an 18 hole group and a 9 hole group, and includes women of all ages and handicaps. The women play from the red tees or the forward teal tees. Golf is a social game and the WGA season demonstrates that fact. The March through November season includes weekly Play-days each Thursday geared for all levels of play, monthly Ladies Night Out (nine holes of golf followed by dinner), a Member-Member, a two day WGA Solheim Cup, and a WGA President’s Cup. Member-Member is a flighted tournament with pay out for winning teams. Prizes for closet to pin add to the excitement. The WGA Solheim Cup is a two day event and is for bragging rights only. Team captains are selected for the red and blue teams. The strategy is to match ladies with like handicaps to play friendly competitive games. The first day of the Solheim Cup is is two 9 hole matches of alternate shot and best ball for each team. The second day is singles match play for 18 and 9 hole groups. The President’s Cup is played once a month with a two day golfing climax in October. Winners in each 9 hole and 18 hole tee group are rewarded for best gross score and best net score. CL WGA members can elect to participate In two area women golf associations, Down East Women’s Golf Association (DEWGA) and Crystal Coast Ladies Golf Association. These tournaments would not be possible without the volunteerism of our lady members. It takes a village! The WGA has a celebratory tournament for Opening and Closing Day. Each year at closing day, new officers are elected and the gavel is transferred. The WGA is a great way for ladies to connect with the Cypress Landing golfing community. The organization fosters ladies to play more, play better, have fun and make friends. Check out WGA posts on Facebook at Cypress Landing golf. If you are a new to Cypress Landing Golf, please be sure to join the WGA….simply let someone know in the Pro Shop or a WGA member you would like to become a member. The cost $35.00 supports WGA activities and prize funds. Membership applications are on The WGA bulletin board in the Club House. See you on the course. We look forward to having new members JOIN US!